Visit old city and Hast Imam complex. Watch how traditional Uzbek bread is baked in special oven “tandyr”. After lunch transfer to Samarkand by car. Time for dinner at local Uzbek family. Sightseeing in Samarkand: Gur- Emir Mausoleum, Shakhi-Zinda necropolis, BibiKhanum Mosque. Visit silk paper making workshop. Learn how to make ceramic pots while watching local craftsmen at work. Then, under the direction of a craftsman, try to make some ceramic pottery yourself. The pottery made by you will be later baked in the kiln and delivered to your hotel. Time for lunch at traditional local café. Afternoon sightseeing tour at the Registan square, followed by the visit to Saint Daniel mausoleum - one of the holy places for three world religions (here you can see a lot of pilgrims). Upon arrival time for lunch at Lyabi House café. Afternoon sightseeing includes visits to Ark medieval fortress, Samanids Mausoleum and Poi Kalon complex with one of the highest minarets in Central Asia. At the end of the day you can watch traditional puppet show in Bukhara. Today is the day devoted to oriental art. Visit old Magoki Atoriy Mosque and learn how famous Bukharian carpets were made. You will also listen to interesting legends from jewelers and craftsmen in one of the old bazaars «Tokis». Time for lunch at local restaurant. After lunch you can visit women’s Madrassah, where the tour leader will introduce you to the life and rules of this place. Today you will take long trip through the KyzylKum desert. Taking this opportunity you can communicate with nomads. During the trip you can also learn about water supply projects and problems of the Aral sea. En route time for lunch at Chayhana (local café). 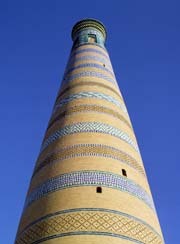 Upon arrival to Khiva climb KalandarBobo tower and view the gorgeous sunset. Sightseeing in Khiva inner town – Ichan Kala with its palaces, mosques, madrassahs and mausoleums. Also enjoy the national Khorezmian dancing inside the harem premises of the last khan from Khiva. Time for lunch at Zainab & Rashid’s family. Afternoon is at your leisure and you can spend it strolling along the town and shopping for souvenirs. Time for Farewell dinner at Taza Bag – Khiva khan’s summer residence. Upon arrival transfer to the airport.